It’s a book about zombies. A worldwide outbreak of zombies. And I LOVED it. Sounds a bit geeky and hokey, I know. But trust me. It’s great. And very much worth your time. My good friend, Jon Witteveen, let me read his copy this past week. And after reading 3-4 pages of it, I was hooked in. 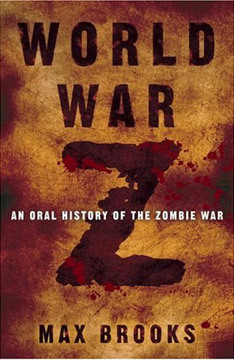 It’s written as if it’s an actual collection of eyewitness accounts to a horrific worldwide plague of zombies. And the tone is played dead serious. The author, Max Brooks, weaves together an incredible narrative of stories. There’s a Chinese sub and it’s commander searching the Pacific for his son. The royal family of England…hiding out in ancient castles? The concept of taking America’s war machine back to Civil-War war tactics. And the most fascinating part of all of it? The stories of people who rose up to meet the challenge and make some really heart-wrenching decisions about who lives and who dies…and the stories of those who simply chose to profit or simply survive off the people dying around them. You see the absolute best of humanity…and the absolute worst. And the characters are so dead-on that you find yourself wondering what you would do. How would you have handled an actual apocalyptic situation? I know. I know. When you think zombies, you think really bad horror films. But in this setting, it’s truly haunting. And I love the “what if?” situations. What if something happened to send our society spiraling back to the Middle Ages overnight? What happens when people truly panic on a global scale? It was unbelievable. I did not want it to end. Really good stuff. This book grabs you and it does not let go. I’ve read where they’ve sold the movie rights, and a screenplay has been written. But this book is written on such global scale…it’s hard to imagine that they could do it justice.